These prices are a guide. I do pass on any discounts for bulk orders. For up-to-date list of colours and other options, books, bags and more, see the Yoga Matters web site. YOGA MATS – with good grip and cushioning, and available in a rainbow of colours, this is the number one choice for students, teachers and studios. Made from a high grade of PVC which is tested AZO, DOP and latex free. Unlike the cheaper aternatives, these mats will ‘wear in’ to develop good, safe grip. Machine washable. BLOCKS – the best quality and value blocks on the market. High grade non-toxic blocks made from eco-friendly material that combines incredible weight bearing qualities with remarkable lightness. Beautiful pastel colours. Supplied unbranded and unpackaged (ie no wasteful shrink wrapping). BOLSTERS – Classic cotton yoga bolster with a strong upholstery fabric cover and a useful carrying handle at one end. 100% cotton covers with a strong zip covering 100% natural cotton inners. Recommended for regular use and yoga studios. Cover removable for washing (cold hand wash recommended, wash dark colours separately). Colours available: Orange, Natural, Yellow, Green, Purple, Burgundy, Navy blue. Note – all bolsters are plain colour fabric (not decorative as illustrated). BELTS – 100% natural cotton with a strong metal buckle – the classic yoga belt that has stood the test of time. CORK BRICKS – Environmentally sound, lightweight – and they feel great. The cork is strong and non slip. Rounded edges for comfort. LIGHTWEIGHT BRICKS – Yoga bricks are used to extend reach and provide support or lift in a number of asanas.These hi-density bricks are solid, providing support without bending or squashing whilst being safer and lighter than the traditional wooden yoga brick. 3 distinctly different dimensions allow you to vary the height according to usage. Made from non toxic EVA foam. Colours available: Natural, blue, purple. CHAIRS – redesigned specifically for yoga use this chair is now stronger and more rigid. Used to aid rotation in seated twists, for support in backbends, in viparita karani, for shoulder stand and many other asanas. Ideal for serious Iyengar students and studios. Both front and back legs are connected with a bar which makes it particularly strong and durable. The bars are 22cm from floor (higher than usual, so that it is possible to get legs underneath them. These chairs are rigorously tested for safety and strength making them the safest and most durable yoga chair available. Recommended for commercial use. 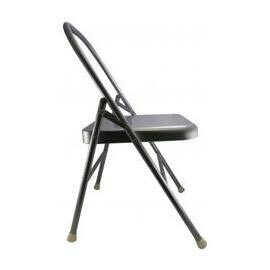 Chairs fold flat for easy storage and have durable non-marking feet. Smart silver colour. ROPES – 2 pairs of ropes (long and short) plus 2 pairs of eye bolt fixings and polyester mortar anchor (glue) – everything you need for ropes practice except the wall. Please read the ‘More information‘ section for advice about fitting ropes. Please seek guidance from your yoga teacher about ropes yoga.